In precisely two hours the deadline will pass for you to enter the competition to find the new voice of the speaking clock. In accordance with trying to be more confident in myself, this evening I pulled out my mobile phone and read the below script and e-mailed it to theoneshow@bbc.co.uk. I’d encourage you to do the same if ever you have sat in your car or on the toilet pretending you are the speaking clock… It will make you feel good that you’ve had a bash and been one of the 20,000 + who will also be submitting an entry (no professional voice artists or actors are allowed to enter). DEADLINE: 10pm on Monday 29th August 2016. Entries received after 10pm on Monday 29th will not be considered. At the third stroke it will be one twenty four and fifty seconds. At the third stroke it will be seven ten and forty seconds. At the third stroke it will be three o’clock precisely. Eight two and ten seconds. Five fifty eight and thirty seconds. Two eleven and twenty seconds. At the third stroke it will be four thirty three and forty seconds. At the third stroke it will be nine seventeen and fifty seconds. At the third stroke it will be six forty nine precisely. Quick update…dresser, heel and heart. I’ve not really got a whole lot of news to share. My weight is currently fluctuating between 247 – 254 lbs and if I’m honest I’ve had some days where I’ve eaten junk and not been in control as much as I’d like. I guess they key thing is that I don’t feel OUT OF CONTROL so perseverance will pay off eventually. I have a few ongoing niggles with my left heel and with only 7 weeks until the Marathon and not having trained for two weeks because of this I’m really not feeling very positive about this at all. The one good bit of news is that FINALLY I got the results from my echocardiogram that I had done 4 months ago (there was a mix up which led to a delay) and there was no permanent dilation of the ventricles so nothing to worry about my enlarged heart. BUT (and there always seems to be a but) the echo did reveal a heart defect I have been living with since birth for 50 years which could explain why my oxygen levels plummeted so rapidly at altitude (when I contracted double pneumonia in the USA last January) as the hole I have in my heart was possibly forced open more under pressure. To be honest I’m not too worried about it. I am being referred to a cardiologist but figure if I’ve lived with it for 50 years that says it all. The dizzy spells I was getting last year haven’t come back since I lost weight and yes I still suffer with tiredness at times but again, I guess that’s a side effect of age and lugging a lot of extra weight about. I just wanted to say thank you once again for being so supportive. Am just getting on with life and just taking this year to continue working on my health and mental well being. 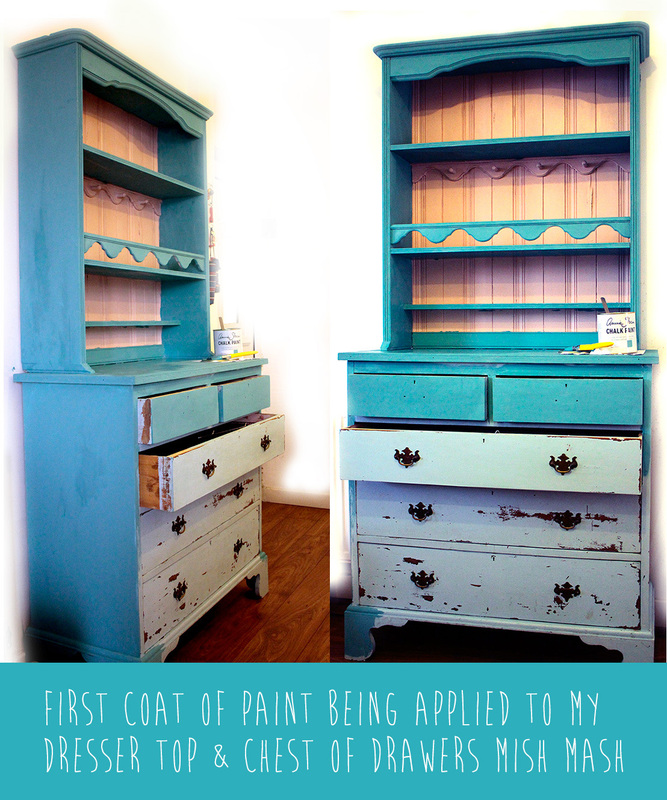 PS: I bought a dresser top and an old chest of drawers off Gumtree and finally I have put them together to make a dresser and am beginning to paint it all up using an Annie Sloan chalk paint. I’m going to paint the backboard a cream colour I think and once painted will distress the edges. I think all my vintage tea cups will look great on it!